Indian Air Force has been Published Recruitment Notification for below Mentioned Post 2017. Other details like Age Limit, Educational Qualification, Selection Process and How to Apply are given below. Boards recognized/affiliated by Council of Boards for School Education (COBSE) will only be permitted. Exact aggregate % of marks before decimal as written in the marks sheet of 10+2/Intermediate/Equivalent OR calculated as per the rules of concerned Education Board will only be considered (For example 49.99% should be taken as 49% and not to be rounded off to 50%). Permanent Domicile of designated districts (as specified in para 2 above) of state of Gujarat or UT of Daman & Diu or Dadra & Nagar Haveli who have passed the qualifying examination from anywhere in India are to produce the Domicile Certificate prior to commencement of examination from appropriate authority as given in sub-paragraph 5(a) above. 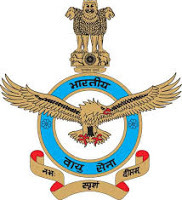 Sons of serving Air Force personnel whose father/mother is presently serving in any Air Force Unit located in designated districts (as specified in para 2 above) of state of Gujarat or UT of Daman & Diu or Dadra & Nagar Haveli, irrespective of their domicile status, are permitted to appear in the rally subject to production of Son of Serving Air Force Personnel (SOAFP) Certificate (format available on AFNET CASB website). Sons of Retired/Discharged/Deceased Air Force personnel residing in designated districts (as specified in para 2 above) of state of Gujarat or UT of Daman & Diu or Dadra & Nagar Haveli, are permitted to appear in the rally subject to production of proof of minimum stay of one year along with original and a photocopy of Discharge Book/Service Certificate issued from AFRO/DAV. During training, a stipend of Rs. 14,600/- per month will be paid. Walk-in interview will be held on 11/09/2017 – 13/09/2017 Selection will be based either Written Test, Adaptability Test-1, Physical Fitness Test (PFT), Adaptability Test-2, Medical Examination. by the Indian Air Force norms or decision. SELECTION IN THE INDIAN AIR FORCE IS “FREE & FAIR” AND ON MERIT ONLY. AT NO STAGE ANY MONEY IS REQUIRED TO BE PAID TO ANYONE FOR SELECTION OR RECRUITMENT IN THE INDIAN AIR FORCE. CANDIDATES SHOULD NOT FALL PREY TO UNSCRUPULOUS PERSONS POSING AS RECRUITING/SELECTING AGENTS. Sama Indoor Sports Stadium, New Sama, Vadodara.